Ensuring children have quality education early in life is vital for their long-term development and ability to contribute to society. In order to achieve quality education early in life, it is integral that children are supported in the home as well as at school. 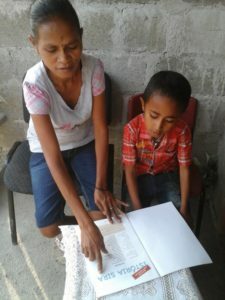 In Timor-Leste, particularly in the rural areas, most parents have limited knowledge and skills in literacy and numeracy and the majority of them did not have the opportunity for a high school education. They therefore struggle to provide the necessary support for their children and feel disempowered to play an active role in their child’s education. To respond to this need, Mary MacKillop Today’s Parents Program provides training for parents from remote areas so they can gain the skills and knowledge to be actively engaged in their children’s learning at home, thereby improving early learning outcomes for children at school. Conduct 10 weekly training sessions for parents on how to support their children’s learning in the home using activities such as reading, writing, singing, craft and games. School Visits conducted by parents at the end of the 10 sessions to learn about the importance of education and practice their new skills in the classroom. Ongoing monitoring and mentoring throughout the year by a Field Officer based in their community. 360 parents attend 10 workshops to learn a range of skills and activities they can use to support their children in the home in key learning areas such as literacy, numeracy, health, music, and art/craft. Over 720 children benefit from receiving educational support in the home by their parents, contributing to their long-term learning outcomes. Donate: $600 could allow one parent to attend 10 training sessions on how to support their children in the home.